The art of delimiting spaces. Rimadesio produces systems for delimiting spaces, such as sliding doors, bookcases and walk-in closets. 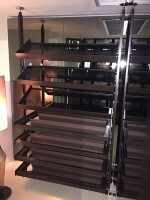 Rimadesio produces systems to delimit the rooms and the architectural definition of the interiors. Doors, sliding doors, bookcases modular systems for the living area, walk-in closets, tables and a large collection of other furnishing accessories: an offer in continuous expansion and in constant stylistic evolution. The projects are characterized by their practicality, where the simplicity of the concept is elaborated through exceptional technical skills. Glass and aluminum, ecologically sustainable materials, are among the main raw materials of the collection, a symbol of the care and sensitivity of the brand regarding environmental issues. The production cycles take place completely within the company and are powered by a photovoltaic system that guarantees over 60% of the total energy requirements. Born in Desio in 1956, Rimadesio immediately came to light thanks to the desire to experiment and innovate. Initially these concepts were applied to the glass processing: this allowed the company to rapidly transform into a large industrial enterprise, soon exceeding the provincial dimension. In the following years the brand has grown fast, thanks to the continuous evolution of design capacity and constant care concerning the materials used. Today the brand is present in the main European countries and also in several overseas countries, such as the United States and Japan. The goal of Rimadesio is to continue developing its design culture and production technology, to offer customers always functionally innovative and aesthetically exclusive proposals able to ensure maximum reliability over time. 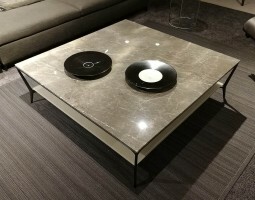 For more information on furniture projects or Rimadesio prices, contact us immediately. Among the various models of Rimadesio doors, the most popular are the sliding ones. The basic architectural concept is to delimit the environments, but without losing the sense of overall unity, which must remain strong. Clearness, reflections, colors and plays of light: the solutions and styles proposed are various and many. When it comes to Rimadesio Velaria, the stylistic interpretation is characterized by the maximum geometric precision. The thickness of the aluminum profile is reduced to the minimum, to enhance the exclusive aesthetic qualities of the glass. On the other hand, Rimadesio Stripe is characterized by the design of the aluminum crosspieces, present on both sides: a detail that allows the communication between spaces, without completely dividing them. Rimadesio Siparium and Graphis doors are also worth mentioning. The first summarizes the concept of the brand regarding interior design: maximum versatility of design, combined with exceptional finishes. Graphis doors, on the other hand, stand out for their essential style: reflective glass panels and a structural profile in aluminum with a maximum thickness. Uniformity that is enhanced by the large dimensions, highlighting the purity of the glass. The doors are always made according to customer needs: they must be designed from the beginning for the destination environment. The goal is to create spaces close to one’s individual sensitivity, with a product that is a combination between technological innovation and style. Rimadesio bookcases are real masterpieces, undisputed protagonists of many rooms furnished in contemporary style. They are characterized by compositional versatility, with comfortable spaces for storing books and every type of decorative objects, and for the exclusive technical solutions. Like other Rimadesio products, the main materials are glass and aluminum: two elements that always guarantee the best in terms of aesthetic originality and structural reliability, if wisely processed. Rimadesio Zenit bookcase is certainly worth mentioning: the central piece is a structure that offers multiple composition possibilities. The shelves are not closed at all, but open: every limitation is eliminated, making the library very versatile and functional. The strong point is the exclusive coupling system of the elements, which allows an “open modularity”. Each Zenit bookcase and each annexed element can be customized, from the number of shelves to the height. The Rimadesio Alambra gives life to the classic types of furniture, such as display cases and drawers, but in a contemporary way. Products such as bookcases have an aluminum structure, with an exclusive design. Alambra in particular is also equipped with LED lighting integrated into the shelves: in this way it is possible to make the most of the objects stored. Wind Rimadesio bookcase is also worth mentioning. This product is made entirely of aluminum and combines technological innovation and a delicate, minimal aesthetic. It is important to underline that the shelves and uprights are joined together in die-casting. The vertical modularity of the bookcase is made of fiber-nylon connecting joints, which are inserted into the uprights and guarantee maximum stability. 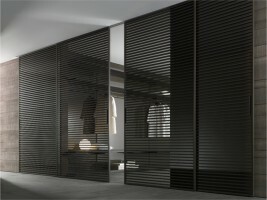 Rimadesio walk-in closet are extremely functional compositional solutions that can satisfy every kind of stylistic need. As regarding other products, maximum customization possibilities are always guaranteed even for walk-in closets. Rimadesio Abacus walk-in closet is undoubtedly one of the most popular. The environment dedicated to personal order casts a new light on the space organization notion thanks to this system. 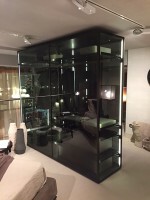 The closet is made of lacquered glass, while the horizontal elements where part of the personal belongings is stored, has a minimum thickness. The main lines reflect a maximum geometric accuracy that immediately gives a sense of order and functionality. In addition, a built-in lighting system creates a tidy and relaxed mood. Are you interested in Rimadesio?